If some senior housing providers don’t act fast, they could end up like Blockbuster Video—largely dismissed by once-loyal consumers and ultimately cast aside to make room for a newer, more innovative competitor. That’s because the senior housing industry is headed into a period of “disruptive innovation,” a trend that also doomed the now-defunct home video rental chain, Robert G. Kramer, founder and now strategic advisor at the National Investment Center for Seniors Housing & Care (NIC), said recently at PointClickCare’s 2017 SUMMIT in Orlando, Florida. Disruptive innovation is when “someone and some idea comes in, in a sense, out of nowhere, and disrupts your business,” according to Kramer. It’s essentially what Netflix did to Blockbuster, and Blockbuster “didn’t see it coming,” he explained. This level of disruptive change is about to hit the senior housing industry—and it’s quite possible that not all companies will survive. “Big changes ahead will lead to big winners and big losers,” Kramer said. Currently, most senior housing providers have a choice they must make, and soon: Either they can adapt and rebrand within the next 10 years, or risk falling into obsolescence. Providers must contemplate these two options due to the upcoming arrival of the next generation of senior living residents, the baby boomers, Kramer explained. “We’re going to be addressing a new customer, who I think will demand new products [and] will insist on new terminology,” Kramer said. Baby boomers, for instance, will be highly insulted by the term “senior care,” and won’t move into any communities that loudly claim to offer it, he suggested. The same line of thinking applies to communities with “retirement,” “aging” or “senior” in their names—baby boomers will run away from those communities, and fast. All the while, senior housing providers will soon need to up their marketing game like never before. In the past, senior housing marketing teams have had it relatively easy—at least when compared to skilled nursing marketing teams. That’s because many senior housing communities have simply been able to position themselves as the better, less institutional alternatives to old, stale nursing homes. In the future, that strategy isn’t going to work. 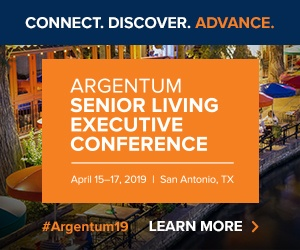 On the whole, senior living marketing teams haven’t had to be as creative or innovative as marketing teams in other industries, either, Kramer said.